Seitai Hoshikai (the Institutes of the Handmaids of the Eucharist) is a Japanese religious institute. Starting in 1973, Sr. Agnes, a fairly new member of the institute, received apparitions and messages from Our Lady. A statue of Our Lady, carved by a local artist in wood, start lachrymations (weeping). Between 1973 and 1981, there were 101 separate events of lachrymation, some witnessed by up to 2000 people. EWTN has a good history of the events. 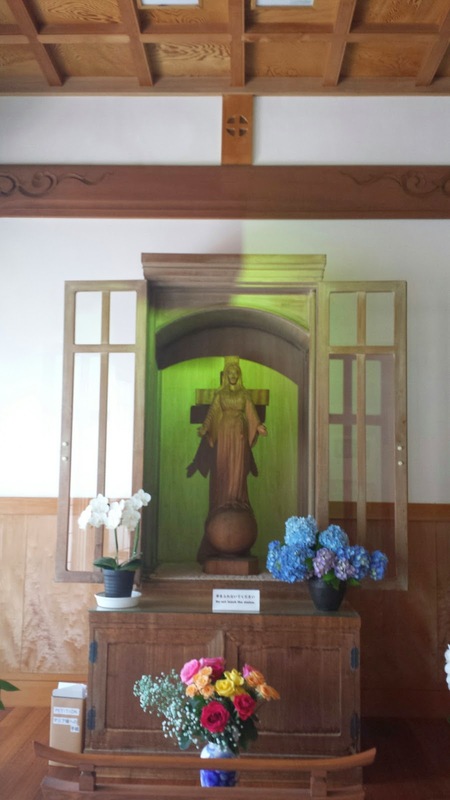 On my last day in Japan, I visited the site of the apparition, in a remote convent, about 20 km north of Akita airport, in the town of Yuzawada. There's few websites with practical details --- this one gives instructions on how to get there from the train station. The airport is further south of the city. I rented a car. It came with a built in GPS device, without which this wouldn't have worked. One would have to know Japanese fairly well to follow the road signs. The people are, of course, terribly friendly and helpful. When I got to the tiny airport of Akita, a lady at the information desk had a sheet of paper with my name on it. She then directed me to a van in the parking lot, and then drove me to the Hertz office. I'd reserved through AAA. The gentleman at the counter actually gave me a larger car, with a built in GPS, and a lower rate! It's a 40-50 minute drive from Akita airport to the shrine. Most of it goes through some pretty nondescript, modern towns. 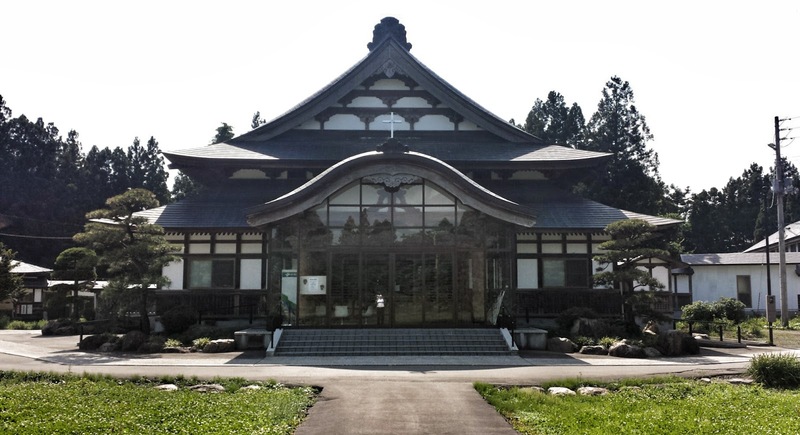 The convent and church themselves are wooden structures, built in traditional Japanese style. There is a large field next door, where there is a Mary garden and the Stations of the Cross have been erected. My flight from Tokyo got in at 11:00 a.m. I was at the shrine by a little after Noon. The sisters were very friendly and hospitable, and spoke enough English to communicate. I first offered Holy Mass in the main church (one of the sisters attended the Mass -- out of a sense of hospitality, or to keep an eye on me, I'm not sure which! :-)). After that I prayed in front of the famous statue, and then went outside to pray the Stations. A few hours after my arrival, I was on my way back to the airport. I was booked to return to Tokyo on the 1935 flight. I pulled into rental place a little before 1530. At 1535 I was at the check-in counter, and ANA very graciously put me onto the 1555 flight, with no hassle and no extra charge. By 1530, I was on board -- this was a new 787-800! My Mass today was offered for the intentions of all the priests and seminarians of the Archdiocese of Atlanta. May Our Lady continue to protect and guide us and lead us closer to her Son! Lovely story. I am confused by something (and after 2 years in a job where we use military time in our coding it still confuses me). If you arrived at 1535, how were you put on the 1355 flight?